Alzer hotel has a little cafe at front side. and offers many opportunity to hotel guest and others.there are many options for drinks and meals.and also its great to seat in the evening.have a dinner or drinks. 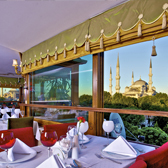 Each morning, you can enjoy your breakfast while looking at the fantastic view of the Blue Mosque and Hagia Sophia on one side and the sea of Marmara on the other side . The Breakfast is made fresh by our local chef and you really get the feeling that you are ready for the city tours ..
are furnished to emphasize comfort with a warm atmosphere. 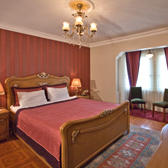 Our rooms are equipped with everything to provide business and/or leisure traveler needs. spot to watch the sunset over Istanbul. Enjoying the sunset with wide selection of wines will be an unforgettable memory. 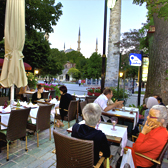 located at the center of Sultanahmet's historic hippodrome where the cultures and religions meet.